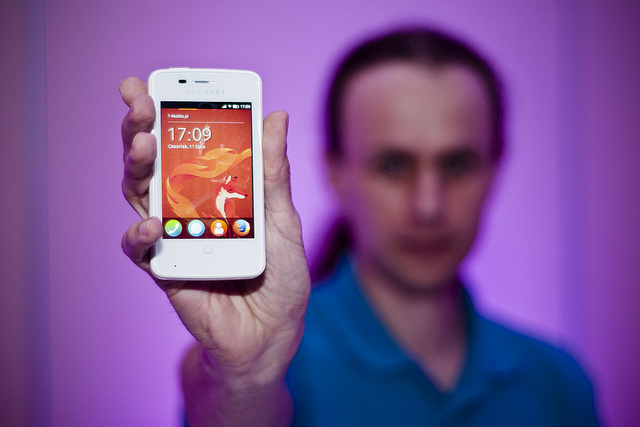 Back in May we launched a program for app developers called Phones for Apps for Firefox OS. We heard from thousands of developers in all corners of the world– thank you for your overwhelming interest. Since then we’ve shipped out heaps of Geeksphone Keon Firefox OS Developer Preview phones and we’ve listed many new apps in Firefox Marketplace, including games like Rooftops and Yatzy, and L’Arrosoir, a lovely French language garden app. If you’ve built and submitted your app, thank you! Hope the rest of you are making good progress. Today we’re opening up the second phase of Phones for Apps for Firefox OS. This phase is about sending you a device (for keeps!) to make it easier for you to PORT and test your existing HTML5 app. We’re hyper-focused on getting Firefox OS phones into the hands of porters – developers who’ve already built and shipped an HTML5 web app and have the time now to port that app to the new Firefox OS platform. Help Mozilla bring the open web to the world of mobile — and gain yourself a first-mover advantage in the Firefox Marketplace. Here’s what you need to know when you apply. We expect to see a URL for a web site, a code repository, or an app platform such as Amazon Web Apps, Blackberry WebWorks, Chrome Web Store, webOS, or the PhoneGap store. If you wrapped an HTML5 app with a native skin to distribute it to iTunes, Google Play or another app market, please indicate the tool you used (e.g., Appcelerator, PhoneGap, Sencha). You must be able to get to work quickly. We are looking for completed apps in September and October. Don’t wait to hear from us. Get started now by downloading the Firefox OS Simulator. REMINDER: If you can’t point us to a live HTML5 app, you will not be eligible for this program. Can’t wait to see your awesome ported apps. Apply now! Photo credits: Thanks to Josh Holmes for the great shot from BrazilJS and to MozillaEU for the image from the Firefox OS Debut Poland. “We are reviewing applications now and will send invitations to the workshop no later than 11 August 2013.” Problem ? What if I have a native c# app that I can port to HTML5, can I still apply. Hi Dubem — Thanks so much for your interest in Firefox OS. Short answer: sorry, native apps are not eligible for this HTML5 App porting program. Geeksphones and ZTE Open devices running Firefox OS are available now for sale online. Please start working on your port and let us know when you’ve submitted it to Firefox Marketplace. We’d love to give it a try. I’m just wondering where you get the phones from? My Peak+ gets delayed until end of October and to my knowledge Peak and Keon can’t be ordered anymore, while the ZTE Open is sold out at eBay. Seriously, if you expect us to put in time and effort to apply for a device, it would be fair to send those who didn’t make it a quick (automated) email. That’s just common courtesy. Thanks very much for your feedback. Regrettably, we don’t have a simple automated way to respond to the volume of submissions received. Does it have to be an app you coded yourself, or can I port opensource html5 apps from other people as well (assuming the licence allows me to do that, for course)? I was curious if in the future you will offer a similar program, but provide a more powerful device, so we could test our apps that may require a little more oomph. @Greg – in the future, many things are possible. @Andrea, we are not lawyers, so this is not a policy statement, but at very least we would expect an explicit permission from the original app author. @Sourav, if your app is already listed in the Firefox Marketplace or has already been submitted, it is not eligible for this program. Thanks everyone for your interest and comments. The license can definitely be sufficient, but in such a case as this, I would say that it’s good practice and respect to connect with the original author first. @Havi, No my app isn’t listed on the marketplace but i bought a geek phone and have many html5 apps that i have made for Nokia (S40 platform) that is ready to be ported for Firefox . So Am I eligible. I haven’t started to build my app yet, so i would like to know when does this second phase closes, in case I can’t apply at time. I wrote an astronomy-related HTML5 app to learn HTML5, but I have no idea if it is up to the public interest or quality level that Mozilla would be interested in. I am reluctant to apply and commit time in this case — is there someone I can contact to get some opinion on this first? @Sourav – Thanks for asking! Please apply (with the link to your live HTML5 app), so that we can review your proposed app for porting. Thanks for selecting me! Emulator already installed and first steps already made! I’m porting 3 apps and really needed the Keon. Thanks! Has anyone got the selection mail. I didn’t get the mail.. I think I am not selected.. :( thou I had 3 apps to be ported. @sourav We have only begun to review submissions. @All – Really regret we don’t have the scale for individual requests and responses. Do keep in mind, if your app is not originally built with HTML5 we will not be accepting your App Port proposal at this time. Thanks again everyone for your passion & interest. And for your apps! And 2 other constitutions in Albanian language. We are working on building more great apps with HTML5. We would be glad if we were chosen. @Alen – Look forward to reviewing your proposal and seeing your apps in the Marketplace. You can start the process of porting your apps now by downloading the Firefox Simulator. Thanks for your comment and your interest in Firefox OS! I would like to port my Chrome web store app ASCIIart [image to ASCII] to Firefox OS,we already begun working very Hard, to Optimize it for Firefox OS,on simulator.and we also working on some really cool Html5 Games. ( waiting to Hear from Mozilla ). I would love to develop for Firefox.started working on sent 4 Apps proposal. waiting for response. I just ported USA constitution form our Google Play Store app. 1.0 Pending approval September 11, 2013. A Mozilla phone would come in handy to help us develop even better apps in the near future. Hello! Can I send several application forms? I have a lot of ideas. @Alexander – Thanks for your interest. Please apply just once with your best existing HTML5 app. Of course, you’re welcome to submit many FxOS apps to the Marketplace. For this program, we’re not looking for app ideas, we’re looking for an app or apps you’ve already built that you’re able to port to Firefox OS now. But if I sended 3 application forms, can I be in this program? Or can I cancel previous forms? Can we apply for the already submitted apps ? I have developed 2 apps and are there on Firefox Marketplace for free download. Am I eligible for this? Or I have to show something else? @Varun. Thanks for your apps in Marketplace. This program is to support developers with HTML5 apps live on other platforms to make it easier to port these apps more effectively. Sorry, app developers with apps already listed in Marketplace are not eligible for this program. @Jo, when we run out of Firefox OS Developer Preview phones to ship, we will close the application and let you know via @mozhacks twitter. Thanks!